Asit Roy from Jalpaiguri, BCA Graduate. 9 YEARS EXP IN TEACH..
are one of expert skill area's of Asit Roy . 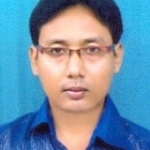 Asit Roy is working in Teaching/Academic/Education industry.